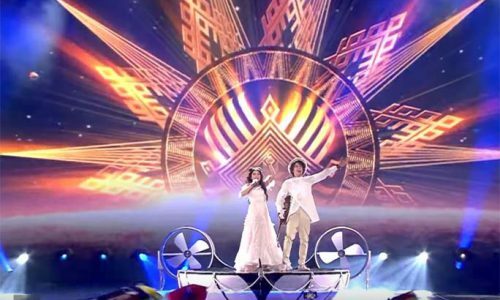 A degree of the surreal, the not-entirely real, and the markedly anti-real. Min set up my slipstream author blog site two years ago. I am something of a Luddite and my ideas about what I wanted were clear but hard to explain- harder still because I did not know the capacities of a site. Min led me patiently through possibilities and then explained and guided me with incredible patience and charm through the process of creating the look and capacities I wanted based on a concept that she enabled me to focus. She has an encyclopaedic knowledge of what is being done with the form and was able to direct me to this or that site to help me articulate what I wanted. Once I had decided she worked with me as she set up the site explaining to me how to work this or that aspect. I really enjoyed being drawn in and to having someone so willing to teach me how operate my site - I was a slow plodding learner but under her guidance I managed it and I can't say how wonderful it is or only to have this beautiful and responsive blog site but to be able to manage it myself. Two years later I don't want a single thing done to it - it is perfectly shaped and constructed not only to make it easy to post there but it is actually enticing so that I am always wanting to go there. I would thoroughly recommend Min if you are willing and keen to avail yourself of her skills and guidance. While we were building the Greylands eBook Launch site, Isobelle asked me to make her a personal webblog to launch a few months afterwards. 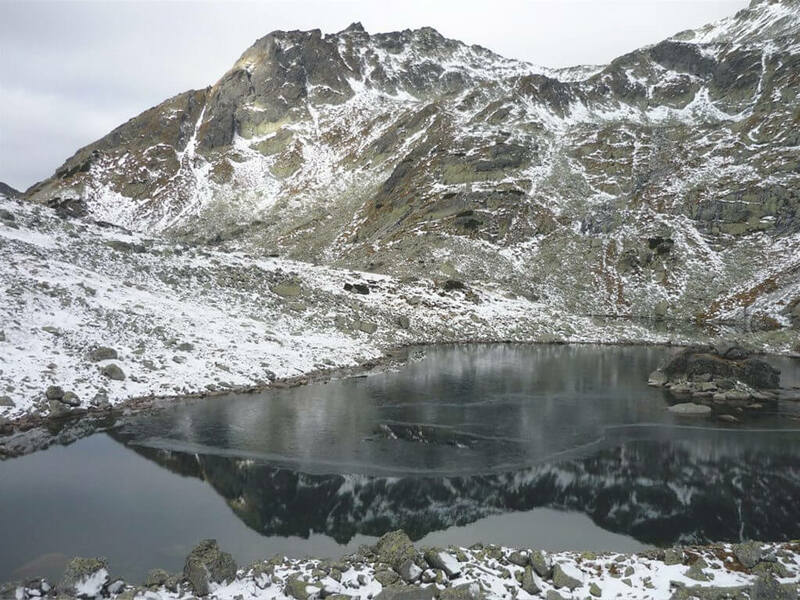 As well as being introduced to wordpress on the Greylands site, Isobelle had, earlier in 2012, participated in a month-long blogging residency on InsideADog and had enjoyed the process. She had a posting plan and an idea already of what she wanted it to be – it was so good to have a client who knew what she wanted from a site, not just wanted one because everyone else had one. I went with WordPress again because she was already familiar with it from Greylands, and the theme was entirely custom. Of particular importance to Isobelle was the ability to add rich formatting and images to her posts, as they were visual journeys as well as written ones. WordPress’ rich text editor and media controls enabled this, and a lightbox plugin gave the images in her posts the added flair of automatically being added to their own popup galleries. There was some custom jQuery added for things like the navigation, and the background scrolling image – the intention being to emulate sitting at a writer’s desk window, looking out at the world. Working on The Slipstream was a dream, in its entirety, because the client was excellent. It’s still a pleasure to work on, when things need updating. And one of the nicest things about it is the positive feedback Isobelle sends me regularly – she’s always saying how much she enjoys the ‘environment’ of the blog, it’s somewhere she likes being. Her bi-monthy essays are wonderful, thought-proviking insights that, while appearing to be personal musings, actually leave you with questions. 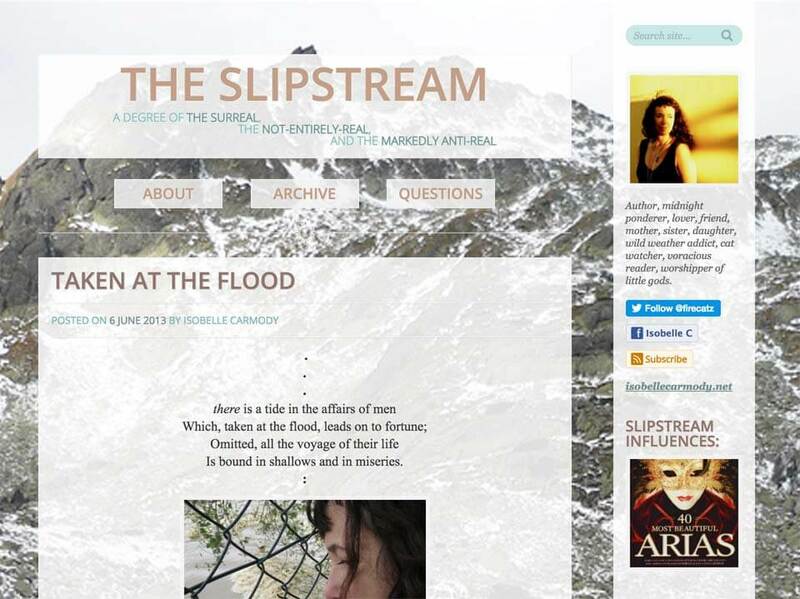 The Slipstream blog homepage; displaying the latest of Isobelle's blog posts, and a thin, static sidebar with incidental items; a brief summary, her social links, influences, what she's currently reading, writing and listening to, etc. 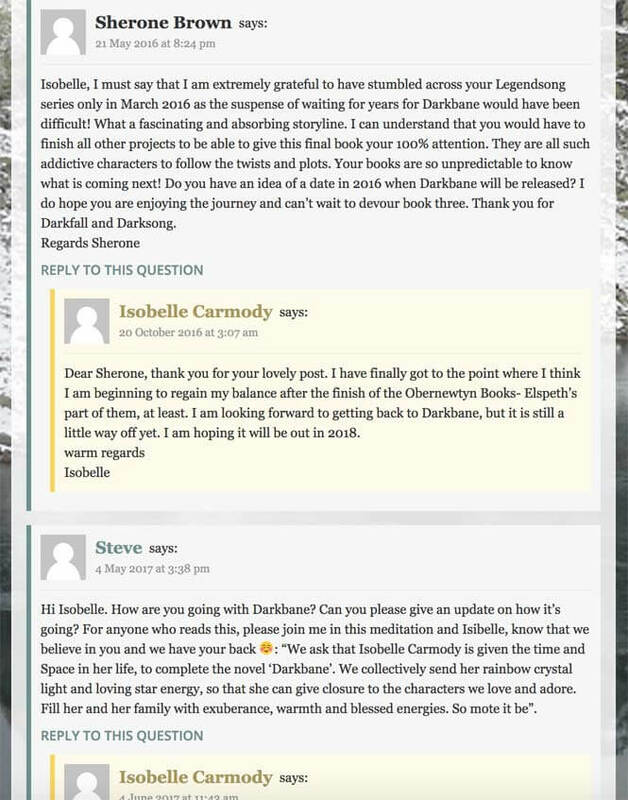 A special questions section was added, so that Isobelle can engage directly with anyone who has a question for her. 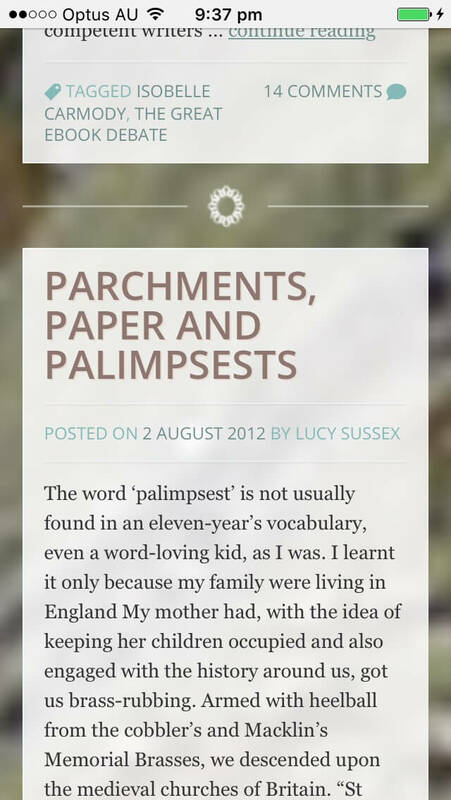 Fully responsive and highly readable on a handheld device! 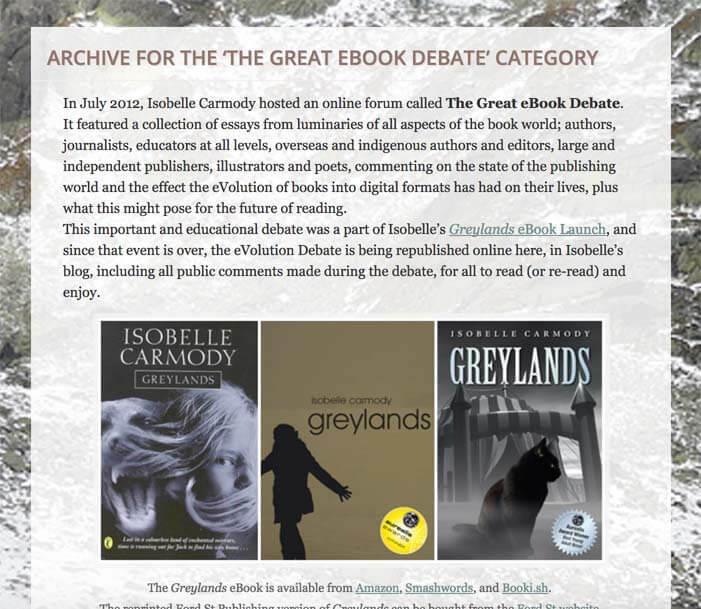 Archive for Carmody's "Great eBook Debate", which we ran together during her Greylands eBook Launch month.